The following article is, like several we have already translated, from the left communist blog, Nuevo Curso. The background is that after 5 years of austerity the government of Prime Minister Maurizio Macri has fallen foul of the global economic crisis and its latest fallout. A year ago he was hailed as the saviour of Argentina when, despite Argentina’s multiple defaults in the last century he launched a 100 year bond offering an interest rate of over 7%. It was oversubscribed and soon it was reselling at an even higher index. This attraction of foreign capital was what Argentina had failed to achieve in two decades. For a time this made Macri the hero of the international financial order but leading economists always knew that any rise in US interest rates (with a consequent rise in the dollar) would sink all so-called developing economies. Argentina is just an extreme case and capital is flowing out of the country just as easily as it flowed in. The bond has dropped in value as has the peso. Macri’s last card is to call on the IMF for a huge loan ($30 billon) to try to bolster the peso but the consequences of this will be further attacks on the working class, as the article below makes clear. Everything pointed to the fact that Argentine capitalism would be one of the first to suffer the consequences of the trade war. Across South America, but in general throughout the world, those countries which "specialised" in a given type of exports for the world market share a model that, in general terms, consists of ensuring the profitability of the national capital as a whole, based on taxing the export sector and using it to subsidise that perpetually weak industry oriented to the internal market. The "model" could not be more sensitive to international prices, exchange rates between currencies, trade wars and monetary storms. In periods of "commercial peace" and increases in the prices of exported goods, their objective will be to strengthen national capital by restricting imports and trying to create, through social policies, a base of domestic consumption, a demand for industry. This is the whole secret of South American "miracles": the rate of profit increases in those periods, capital reproduces happily and the state has a cover to sell its policies of strengthening demand as "productive revolutions." They are temporary joys. The Venezuelan case is paradigmatic. And the Argentine case, even starting from a much more developed national capital, follows the same script. The lack of an internal market to sell new products results in an endemic lack of profitable investment opportunities for national capital. 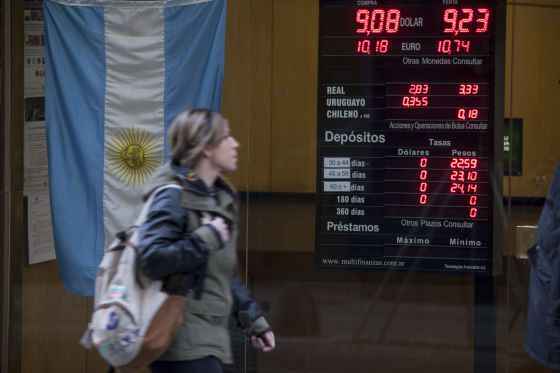 That is why the "normal" deficit in the balance of payments - inflows less outflows of capital - of Argentina reaches a whopping 30,000 million dollars a year. Argentine national capital "always bleeds". And it does not do so because of the alleged "stateless" nature of national capital or because of the "betrayal" of a national bourgeoisie "sold to imperialism". It does so precisely because Argentine capitalism has long since reached the imperialist stage. In the absence of markets to which to export industrial goods and services, it exports capital. That its peculiar geographic and economic conditions do not allow it expansionism -although it suffers a permanent tendency to militarism- does not negate the entire economic reality. Imperialism, under Argentine conditions, is exactly what we see. That said, no matter how small the market cuts imposed by the US in its South American chapter of the trade war, they could only aggravate the general scenario for a suffocated capital. The rise in rates in the US further increases the incentives for flight. The last few months the painful issue of capital flight seemed to have no end. From there, the market opens a highway until the devaluation of the national currency: if the sale of pesos increases to buy dollars to "take away", the price of the peso will fall. That is a devaluation. Macrism was a bet by national capital that occurred within an international framework ... that did not materialise. The Macrist strategy required a scenario that at the time seemed possible: the simultaneous maintenance of the Chinese demand for soyabeans and the development of new energy markets in a US that would prioritise strategic considerations above its trade balance, a policy defended by Clinton and the Democrats. If exports kept rising, the reduction of protectionism (customs) would pull prices down without devaluing the currency, and with that margin they could eliminate the massive subsidies to basic consumption which during the era of Kirschnerism  had preserved a minimum social cohesion. National industry, in a context of controlled inflation, could reduce its dependence on the state by recapitalising with foreign investments that the government itself would try to capture by explaining the "model" with all due fanfare. The expected increase in productivity, they thought, would also serve to boost an endogenous and moderate rise in real wages ... which would make it easier to end "trigger clauses", that is, the automatic upgrading of the wages to keep up with the index of prices. In short: it was the umpteenth "modernising" programme, very similar in structural terms to the "Felipism"  in the Spain of the 1980s ... although starting from a weaker domestic market and a much more difficult conjuncture for the international expansion of the large national companies. But if the premises were in place, "it could work". However, the first contacts with the Trump administration made it clear that the US was not going to open markets but rather the opposite and that the only possible strategy for Macrism was to try to minimise the damage by emphasising strategic considerations that, on the other hand, were not central to the United States. It was all about playing for time, while Brexit provided opportunities for an alternative path (Great Britain, Norway, etc.) and another (EU via Germany and Spain) due to the fracture that was developing in Europe. But the negotiations with the EU taking place in the collapsed Mercosur framework gave rise to ever more difficulties. And the Macri government has been inventing alternatives to the alternatives to the alternatives, returning now to the transoceanic dream in an anguished race against time, desperate to the point of incoherence. The Argentine bourgeoisie and small bourgeoisie, meanwhile, have lost confidence little by little in Macri’s promises, reduced their expectations of business and far from investing were given to speculation with renewed passion, seeking a "safe haven" from the new monetary storm that was drawing up on the horizon. The workers have not been mere spectators of this whole process of the decomposing strategy of the local native-born bourgeoisie. The rise of precarity (34.2% of workers work in the "black economy"), the first attempts to attack the pension system, the "Tarifazo" (end of subsidies to basic energy consumption, up 1600% in some cases) and finally the labour reform, as yet to be approved, have shown the true core of the needs of Argentine national capital. Under the general conditions of capitalism today there can be no "modernisation" of the national capital without a direct attack on all the workers. The famous "dualism" of the labour market is an illusion, as seen with the INTI, no one will be left out . The more the international market closes, the greater the monetary difficulty, the more direct and the more brutal the attacks on wages and working conditions will be. Capital has no other means to ensure profitability. 1 The "export model" of Argentine capital will suffer in the trade war and the foreseeable foreign exchange storms ever more dramatically. Macrist expectations have become the «story of the milkmaid» who just began to walk .. but tripped over the first stone. There may be periods of apparent "tranquility" in the coming months, but exchange rate and currency wars are going to mark the immediate future at the global level and every strategic move of the US, China or the EU ca not help but move the terrain on which the Argentine government operates. 2 Certainly, the possibilities of expansion and growth of the national capital on the world market are absent and not to be expected. The Argentine government will jump in and out of imperialist alliances looking for loopholes to finance itself and increase exports, but it is materially impossible for it to find an alternative equivalent to its initial expectations. That is why the short and medium-term perspective are of increasingly major attacks against working conditions and wages. Don’t even think about the famous reduction of poverty. 3 The political response of the Argentine bourgeoisie is to push Macrism to an increasingly open attack against the conditions of the working class, insofar as possible avoiding "damaging" Peronism and using unions to derail and channel the foreseeable protests. For the time being, it seems that their strategy involves having "left" alternatives that are useful to save whatever remains if a massive response from the workers develops. 4 The workers are alone. All the political apparatus of the state, from the unions to “the left”, will defend, above all, the survival of national capital. If an epoch of social contestation opens up, the petty bourgeoisie will engage in the thousand flavours of the "national left" and nationalism, swearing and perjuring that "another national capital is possible". But it is not. The question is precisely to break the national and nationalist cage in which they intend to lock us up. Any "national solution" will be a solution for the national capital and therefore will be paid at the expense of the workers. We would put this sentence exactly the other way around – it is the failure of investment by the local bourgeoisie, who gain more profits from both agricultural exports and investment on Wall St than in developing an industrial base in Argentina, that explains the failure of the development of an internal market but we continue to discuss this issue with the comrades. The history of the Argentine economy is in many ways a metaphor for the history of the capitalist economy in general in its most extreme form. Until c.1880 it was a relatively backward agricultural exporter based on salted beef, leather and other animal products. The invention of barbed wire and refrigeration led to a massive expansion of this trade and by 1905 Argentina was considered on a par with richer European countries with a per capita GDP close to 80% of the USA. However the First World War and the Depression of the 30s reduced this to about 35%. During the Second World War prices for Argentina’s exports were high and goods from abroad were scare so import substitution led to a period of the biggest investment in manufacturing. This led to the development of a middle class which was calculated at 40% of the entire population making it the biggest in Latin America. Peronism or Justicialism is the movement founded by Juan Peron who was elected three times as President of Argentina from 1943-1955 (when he was deposed by a military coup). It was close to the corporatism of Mussolini in proclaiming that it stood for social justice, economic independence and nationalism. In subsequent years it has taken on various forms (and its Right and Left wings have at times murdered each other) but 11 of Argentina’s 16 Presidential elections have been won by Peronists. The last of these were Nestor Kirchner and his wife Christina Fernandez (who succeeded her husband in 2007). They pursued the traditional policies of currency controls and trade restrictions based on import substitution alongside subsidies for such things as energy in order to maintain social control. However this could not prevent rampant inflation and given its stand-off with some US creditors was unable to access international financial funds. Maurizo Macri was elected in 2013 to the applause of the international financiers with the intention to renegotiate Argentina’s debts and bring down the foreign trade and budget deficits. The dualism of the labour market idea is that some workers will be immune from precarious working conditions but the example Argentina’s INTI (National Institute for Industry and Technology), now being restructured, shows that even top researchers can be thrown out of the workforce.